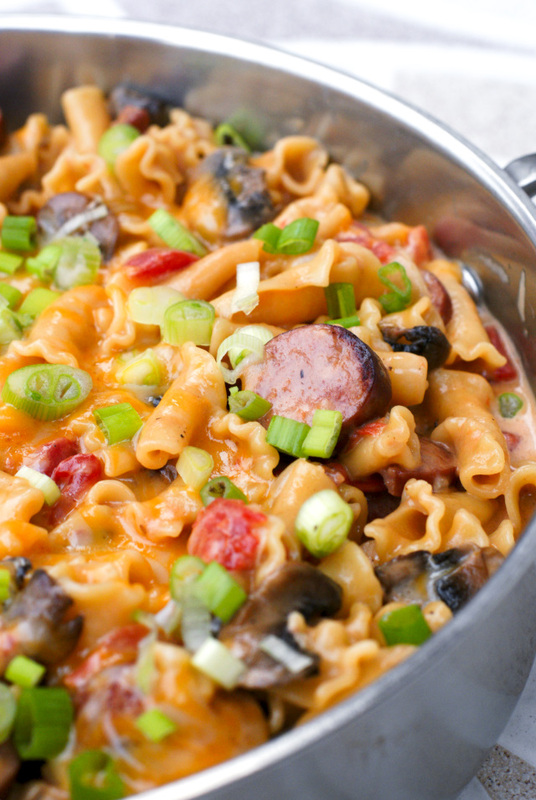 One Pot Cheesy Kielbasa Pasta is an easy to make skillet meal that that features lean turkey kielbasa, pasta, veggies, and lots of melty cheese. The best part is that it all cooks in just one pot! We are beginning week three in our new home. Week three and we still have no fridge, no dishwasher, and no oven. They're on order to be delivered this week, thank God. The life of a food blogger without a functioning kitchen is tough, I tell ya. It's like telling a painter to paint without a paint brush. Thankfully, we have a stovetop in the center island of our new kitchen, which gives me at least one source for cooking. I've become the queen of the skillet meal. And because we also have no dishwasher, I'm a big fan of one pot dinners like this one! This recipe was perfect for me in our current situation! We've been shopping daily (which I can't stand doing) and picking up dinner ingredients for one day at a time. 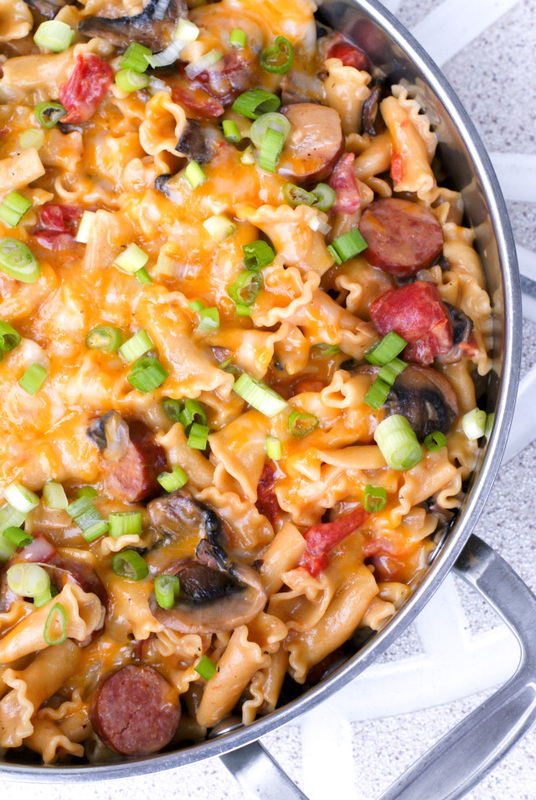 I saw this recipe on Pinterest when I was browsing for new skillet meal ideas and I immediately knew this is what I would be making for dinner. I knew my family would love it, and I was right! My 2-year old lovingly refers to kielbasa as hot dogs, so he was on board, and my 6-year old loves pasta, so she gave this meal her seal of approval, too. My husband? He complimented the meal several times during dinner and was a big fan of the cheesy factor. This one's got lots of cheesy goodness going on. Like I said before, my favorite part of this meal was that everything cooks in one pot. And that there were mushrooms. And pasta. And cheeeese. Okay, I loved everything about it! This one's going into the permanent rotation! In a 4 quart skillet, heat the olive oil over medium-high heat. Saute the kielbasa until browned, about 5 minutes. Remove from the pan and set aside. Add the onions and mushrooms to the skillet and season with a pinch of salt and pepper. Cook for 5 minutes, or until softened, stirring occasionally. Add the garlic to the skillet and cook for 30 seconds more. 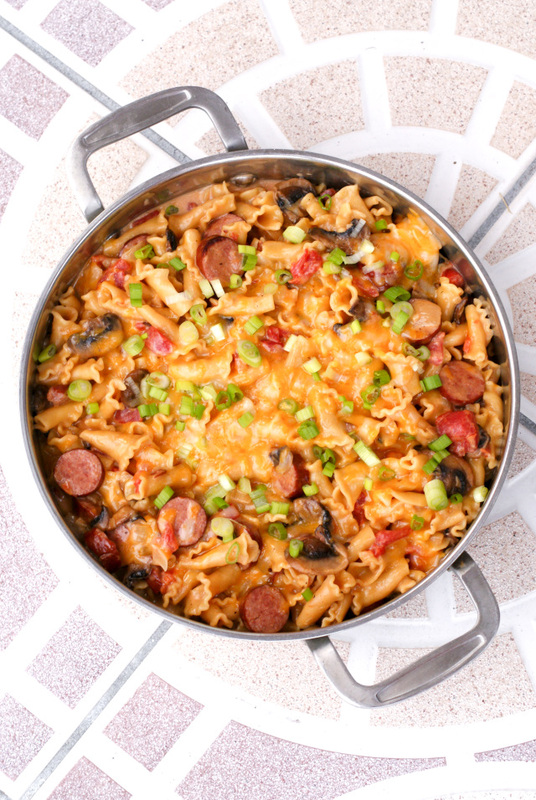 Add the browned kielbasa, chicken broth, diced tomatoes, heavy cream, and pasta to the skillet; season with salt and pepper. Bring the mixture to a boil, cover, and reduce heat to low. Simmer for about 20 minutes, or until pasta is tender. Remove from the heat and stir in half of the cheese. Sprinkle the remaining cheese on top and cover for about five minutes to allow the cheese to melt. Top with sliced scallions and serve. Small shaped pasta works well for this dish. Elbows, bow ties, or rotini would be good, too! I let my kids choose and they picked Campanelle. Smoked turkey sausage is a great substitute for the kielbasa, if that's what you've got on hand. I had a 1 pound box of pasta and eyeballed the measurement. It was around a half a box! When do you put the Kielbasa back in?